Stream all episodes of the Product Management podcast, Product Popcorn, here. Subscribe to Product Popcorn - a podcast about Product Management. Read all show notes for the Product Popcorn Product Management podcast here. Or stream all episodes in the Show Notes below. Join Kimberly and Adam as we tour OrthoFi's downtown Denver office and speak to their incredible supply of Tang. rthoFi's mission is to make a beautiful smile affordable for everyone. Originally started as a way to help finance orthodontic services, the product offering has now expanded, now offering a robust software product for orthodontic practices and patients. Easily see which features your customers actually use in one simple chart with Feature Audit. Visit our quick tour of Feature Audit on Product Popcorn. Games! Double shot, shuffleboard, and sumo suits! They have a gong. I am very, very jealous of this. Join Kimberly and Jamie Love as we tour Havenly's office and speak to their superbly data-drive PM team. 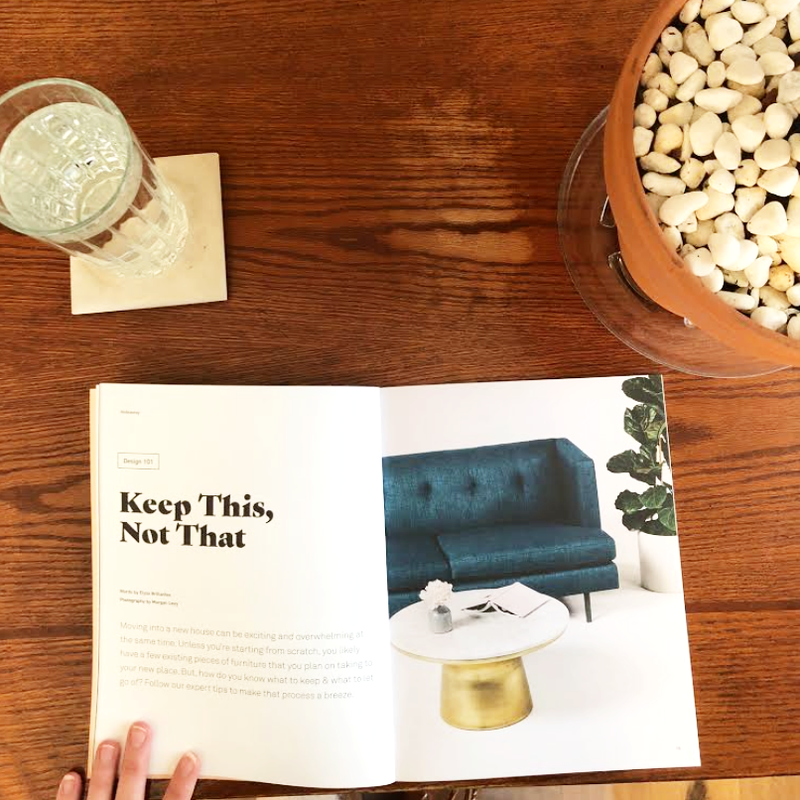 avenly is an online interior design company; Havenly partners its users with an interior designer to create the perfect space, all online. 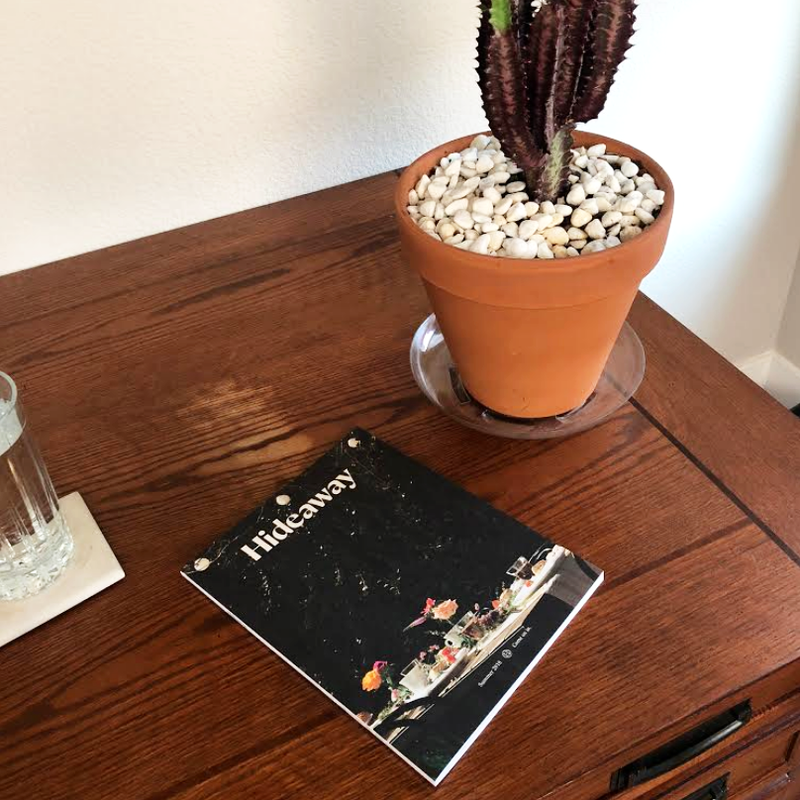 It's an incredibly cool, female-founded company - read more at havenly.com or download the Havenly app! Beautiful, comfy couches with lucious throw pillows - I suppose this should be expected in an interior design company! A conference room named Rosé. They take wine seriously at Havenly. A diverse workforce: Havenly takes diversity seriously in their hiring practices, and it's evident from the moment you walk in the office! 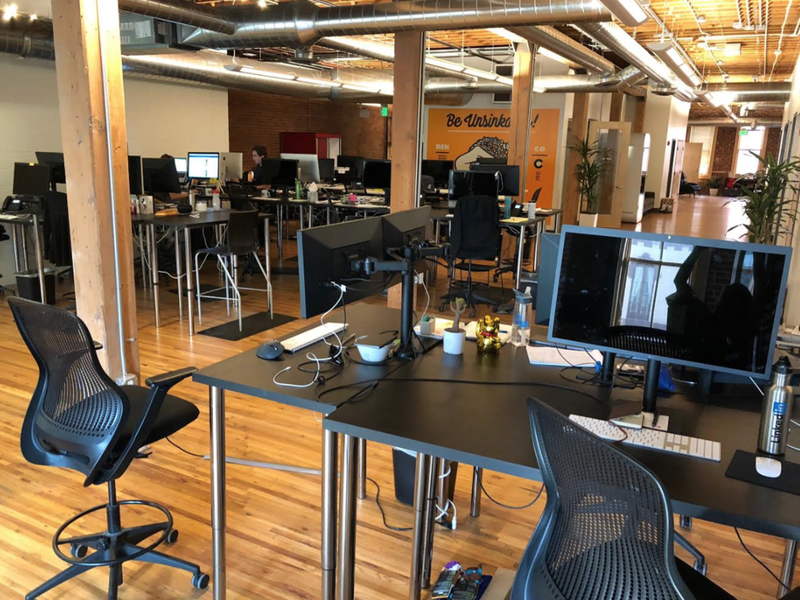 Join Kimberly and Adam as they tour the beautiful downtown Denver office of GoSpotCheck with friend of the pod, Taylor Linnell. GSC’s web and mobile apps help sales reps who work in the field conduct surveys, gather data and provide accurate reports about store inventory, sales and more. Taylor also talks about their newest product - HiFi - which has some pretty sweet visual recognition ML capabilities. Easily see which features your customers actually use in a single, beautiful chart with Feature Audit. Visit our quick tour of Feature Audit on Product Popcorn. 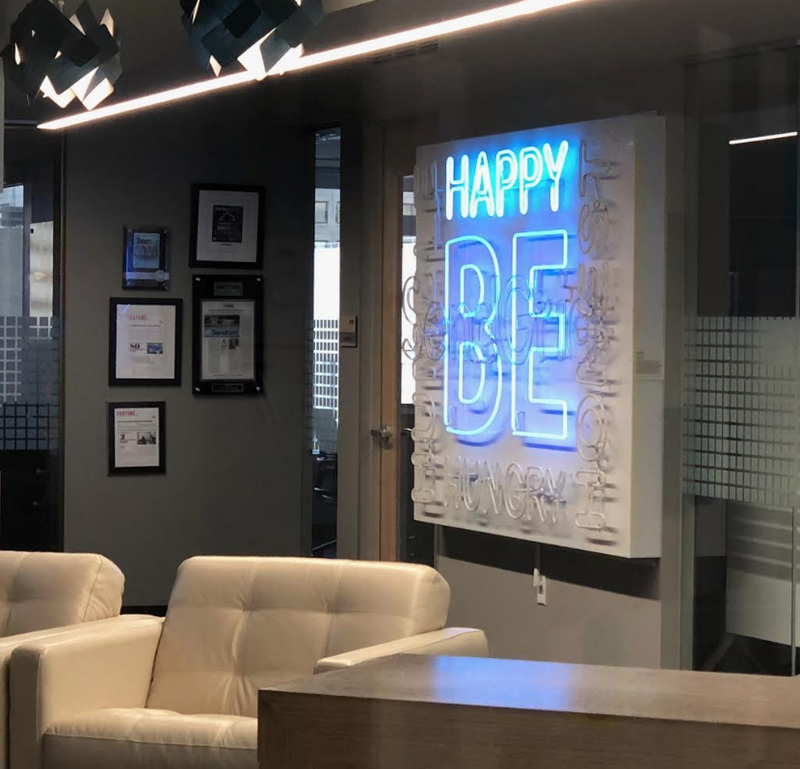 Join Kimberly and Jamie Love as we tour SendGrid's new downtown Denver office and chat with SendGrid product manager James Heimbuck. SendGrid is a customer communication platform for transactional and marketing email. They also focus heavily on developer tools for email. Join Kimberly and Adam as they meet the PM team at Choozle in their Denver office. Choozle is an independent & self-service digital advertising software platform. Choozel's a real-time programmatic platform is built for streamlined operation, yet powerful enough to handle campaigns at scale. Open, transparent culture full of friendly, energetic employees make this office a pleasant place to spend your week. Join Kimberly and Adam as they tour Shutterstock, and confirm that Adam DOES, in fact, actually work there. Shutterstock is an online marketplace for stock photography, videos, and now stock music as well. Visit shutterstock.com to learn more. Both Adam and Jamie Love work there - super bonus! Easily see which features your customers actually use in one simple beautiful chart with Feature Audit. Visit our quick tour of Feature Audit on Product Popcorn. We’ve all heard lots of product stories from entrepreneurs who made it big, but what about product people who *almost* made it big? Taylor tells us about his breaking-into-product journey. After finishing college, and a short stint selling pre-paid cremation products in the Bay area (which is the best story ever), Taylor comes up with the idea for his first product, and becomes an almost-famous entrepreneur (my words, not his). After a series of successes ,'failures' and a stint as an EIR, Taylor finds his niche as a product manager in a tech start-up. This story highlights how the entrepreneurial spirit plays into being a successful product manager, and how a love for solving problems is key to success as a PM. Also, in general is just a delightful career journey into product management. Our guest today is Mia Fuhrman, a machine learning engineer. 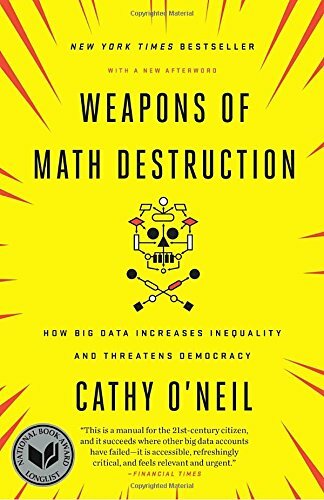 Mia turned me onto a book called Weapons of Math Destruction, which all product managers should read. The book talks about how we’ve outsourced human decision making to machines, with the justification that humans are biased - but algorithms aren’t. HOWEVER, this assumption is *wrong. * And algorithms - as we’ll demonstrate through use cases from the book - can actually be worse than people. This week on the podcast we have Leah Brite, product marketing director at SpotX, to tell us about Ad Tech basics, and also product marketing. Ad Tech is an important industry to know about right now, and Leah walks us through an Ad Tech customer journey, and gives us some general background on how Ad Tech works (and SpotX's platform in particular. Leah also talks about core functions of product marketing, how PMMs (product marketing managers) and PMs (product managers) can work well together. There's also a recipe for homemade bitters in there somewhere. All product managers should know the basics of blockchain - what it is, what it can do, and popular use cases. I'm obsessed with Black Mirror, and I think it's the perfect show for product managers, since it explores how technology can be used in different ways. It's also a great exploration of what products NOT to build, unless you're a PM interested in creating a tech-driven dystopian future, that is. During this mini-fun-Friday-episode, which starts with a pretty spectacular rap from Jamie Love, we discuss Season 4's Arkangel episode. Our guest today is Scott Williamson, VP of Product at SendGrid. Scott has worked at SendGrid since 2013, when the PM team was small, and has grown the product team to support SendGrid's (much larger) size. Scott has a great blog series on the 7 keys to scaling product management, and we hit some of those key points, while diving deep on #7, which is building a developer experience team. If you work on a product used by developers in any capacity (i.e. maybe you work on a SaaS product which also offers a suite of APIs for devs), listen up to the Developer Experience portion of this episode. SendGrid is doing this right, and all PMs can learn from Scott's experience. Before the interview, Adam and I talk feedback from our doctor episode, and my updates on the Grow with Google scholarship. 19:30: Growing a team - what's important as you scale? Today we interview gaming product manager Peter Knudson, who works at Unity, an online gaming platform. Peter gives us some perspective on how he got into product management and specifically gaming, and monetization models in gaming that can be applied to other products outside of gaming. Before the interview Adam and I report on Udacity’s Grow with Google scholarship (for PMs who want to learn to code), Kimberly starting her MBA, and we rant about how to improve the user experience of the wine store. Please leave the podcast a review on iTunes, Google Play or Stitcher! I’ve been looking for a doctor for some time to come on the podcast and talk about product problems in medicine. Stuff like - Why is innovation adoption so slow in medicine? How will AI change my experience at the hospital? Why can’t I schedule an appointment with my doctor online? What are the problems that product people can solve? We’re joined by Mike, a Denver-area radiologist, who answers these questions, and brings to light other unexpected product problems that are just waiting to be solved. Finally - how can tech work with medicine to solve problems that we’ve already solved in other industries? 17:20 - Will AI steal doctors’ jobs? 42:45 - Tech + Medicine solving product problems. Brian Rhea did a presentation Jobs-to-be-Done theory, and I wanted to share it with my podcast listeners. I had never heard of Jobs-to-be-Done before seeing Brian’s presentation, and now I'm obsessed. It's changed the way I think about my product its features. Use this theory when you’re scoping out requirements, thinking about your product's competitors, and especially working with your UX team. I had some recruiting questions and luckily was able to meet Emma B. who can tell us about her experience in recruiting, sought after skills in the industry, and do’s and don’t’s if you're looking for a new gig. We’re going to talk culture. We’re going to talk in-demand skills. We’re going to talk sticky situations and how to handle them. And we’re going to get Emma’s opinion on beer in the office. Jeff Weiland, architect at Spectrum, weighs in on how product managers and architects can work well together. We talk about the difference between application architects and architects, what the ideal architect - product relationship is, and define the difference between a developer and an architect. Wrapping up 2017, I’d like to thank everyone for listening during our first 20 episodes. We have LOTS of great stuff coming up in 2018! Join me and three other female product managers as we discuss gender in the tech industry. WAIT! MEN! Please keep listening! I promise the isn’t just an hour of man bashing. This year was a little crazy - from Susan Fowler’s weird year at Uber to the Google Manifesto - and I thought we should dedicate an episode to answering some tough questions from women working in the tech industry. This episode is relevant to everyone, because if you’re not a woman, you at least work with women. In the podcast, I mention a Harvard Study with Harry vs Hariet. I got that wrong. It's actually John vs. Jennifer and the study was conducted at Yale. Following up with last week's discussion on different styles of Agile + swarm, today I have two guests to talk about experiments in scaling Agile. William Kammersell and Lieschen Quilling both work on Agile Central at CA Technologies (formerly Rally Software). I originally saw William speak about this topic at Rocky Mountain Product Camp - rmpcamp.org. William and Lieschen have done a lot of experimenting with scaling Agile in order to get their ‘big idea’ features out more quickly, and they tell us how they performed these experiments. SPOILER: You need beakers and lab coats (aka 'jackets') to get started on this Agile experimenting. We also dive into how teams are organized at Rally, how to get your team on board with experimenting, how to elicit feedback, what defines success, and how to get started. I originally saw William present this topic at Rocky Mountain Product Camp - a *fantastic* event for PMs if you’re in the Denver/ Boulder area, which he helps organize - rmpcamp.org. This week on the podcast my guest is Tyler McCann. Tyler is a product manager at Shutterstock, and I asked him to come in and talk about Agile, different styles of Agile, and how he tried out swarm pattern at Shutterstock. Spoiler: We do complain about JIRA for a solid 10 minutes. But then we actually do talk about different styles of Agile in product management, I promise. Tyler also talks about how he convinced his dev team to try out Swarm Pattern. If you don’t know what swarm pattern is or how it works, you’ll have to listen to find out.